Starting with the Winter Marathon Rally and ending with the East African Safari Classic Rally, Sports Car Digest covered a diverse range of nearly 90 historic car races and rallies in 2013. There are interesting reports and results from each but, as always, it’s the perfectly timed, expertly composed action shots that really make us stop and stare, that make us feel like we’re right in the action. To celebrate the effect that these photographs have on us as well as the dozens of talented photographers who capture them, we have once again narrowed it down to the 50 best pictures of the year. Narrowing it down to 50 certainly wasn’t easy, as the shots worthy of high praise number not in the dozens but in the many hundreds. The list is done, however, and similar to our Best of 2009, Best of 2010, Best of 2011 and Best of 2012 contests, we are asking for your help picking the best vintage car racing photo from 2013. Simply vote by leaving a comment below indicating which photo is your favorite image. If you feel that we’ve overlooked a particular picture, please feel free to nominate a candidate by linking to the picture in your comment. We will announce the winner in the January 23rd edition of our newsletter and in the comment section. We are again choosing at random THREE winners from the comments to receive a large print of their favorite photo, so be sure to include your email address in the comment form so we can reach you. In order to win, you must also be a subscriber to Sports Car Digest Weekly, so sign up for our free newsletter if you haven’t already. Now, sit back and enjoy the top 50 best pictures of 2013, sorted by the date taken. Thanks for the constant stream of memories. Seems like only yesterday we were racing the OSCA, 250TR and Elva Porsche. Among the many great photos here, my favourite is 1955 Porsche 550 Spyder 1500 RS at Mille Miglia (photo: Julien Mahiels). All are to be commended but this captures it best for me. I´ve got to go with Dennis Gray´s photograph of Peter Giddings concentrating on the job in hand in turn 11, in his 1935 Alfa Romeo Tipo C 85C-35. Peter Giddings in the 1935 Alfa 8C is my vote. The cars are all beautiful, but this is a photographic contest, not a car contest. The photographer blended into this Giddings photo the driver (the other half of the racing equation) at work, color, motion with the blurred rear wheel, and incredible detail on the car, like the arm rest, the head rest and the gas cap. Awesome! The two C-Types in the rain at Goodwood would be my vote for car pic! I must agree with Chris Ballantine, “Lights, camera, action for the sheer drama at Spa” is my favorite, too. It’s just so dynamic and captures the thrill of racing around the clock beautifully. Though I must admit there are at least a dozen other photos I liked practically as much, like the Waldegaard Porsche or the rain-battles at Goodwood. +1 for Brian Johnson at Sebring. I have three nominations for favorite image from 2013. Dirk’s image of the little OSCA MT4 2AD during the Mille Miglia. Julien’s image of the 3.0CS at Spas La Source. Tim’s image of the 300SLR. Paul Stewart’s look of concentration makes the image. Maybe it’s because I’ve always had a thing for D-Types, but I pick Michael DiPieco’s shot from Lime Rock. The way he captured just the car and foreground and background without showing any of the pavement was brilliant. Julien Mahiels- Ex-Bjorn Waldegard Porsche 911S that won the Monte Carlo Rally was at the Eifel Rallye Festival. Composition, gorgeous light and location. Just beautiful. Selecting the best of great photographs, it is pretty difficult to pick between Dennis Gray’s image of Peter Giddings at work, or Julien Mahiels shot of the Porsche 550 Spyder in the Mille Miglia. I’m going with the close up shot of Peter Giddings driving the 1935 Alfa Romeo. Good work Dennis, and Peter! Start of the RAC Tourist trophy at Goodwood. Picture taken by Tim Scott. You see the beauty – you sense the speed – and you feel the sweat in Mr. Stewarts very concentrated face. 1965 AC Cobra 289 at Oldtimer Grand Prix (photo: Julien Mahiels) has my vote. Great colors — an artistic take on the classics. Brian Johnson in the T70. One wheel up. On the track or on stage, Brian never lifts. Many great photos – hard to choose one. My vote: “1955 Jaguar D-Type at Lime Rock Historic Festival (photo: Michael DiPleco)”. Definitely the Peter Giddings photo. I’m not a big Shelby fan, but just from a purely photographic standpoint, there is something about the photo that grabbed me. The amazing color of the car, and perhaps the mysterious black vortex cloud above the car. What the heck is that anyway? Do they have tornadoes in France? Black & white’s always best for vintage cars anyhow! My pic is Dennis Gray’s “A study in concentration” (Group f64 class). It is amazing what he do with that old Seneca 8. If I have to pick only one, I vote for : 1926 Delage Grand Prix 15-S-8 driven by Peter Giddings in the corkscrew during the Monterey Motorsports Reunion (photo: Dennis Gray), on page 5. Whatever my opinion of the other photos, the choice of Seb Loeb’s 2013 208 T16 missile on Pike’s Peak is decidedly NOT a “Vintage Car Racing Photo”!!! Here’s my choices for the best: Smile For The Camera – Jaguar C-Type driver says hello at the Goodwood Revival (photo: Tim Scott). Can I choose all the images of Julien Mahiels ? Everytime, beautiful cars combined with great action and perfect light ! I’ve been many times to Spa but never saw it from this point of view and this makes it a great photographer! Peugeot 208 T16 Pikes Peak of Sebastian Loeb (photo: Nathan Leach-Proffer) is amazing. I hope you don’t take this the wrong way, but the quality of the images this year is superior than last, which was superior to the prior year…and so on. You keep improving a product that doesn’t need it. 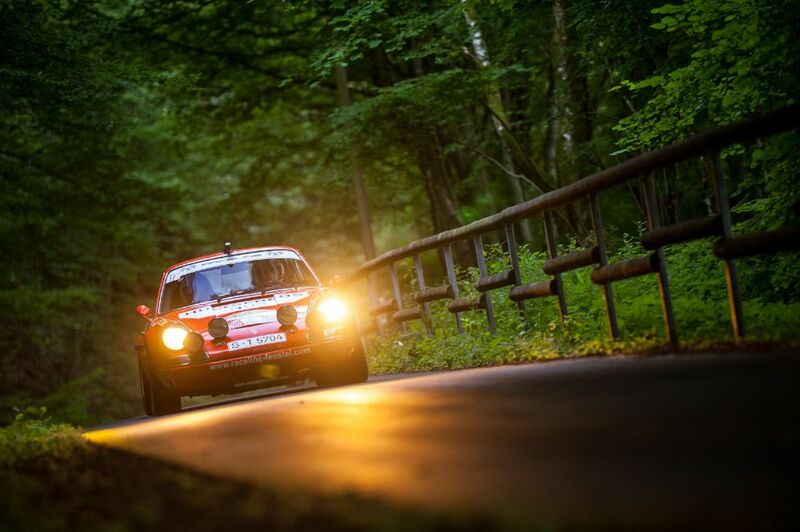 My favorite for 2013 is Julien Mahiels’ picture of the 911S at the Eifel Rallye Festival. In the year of the 50th anniversary of the 911, that is by far, hands-down the best picture of the famed Porsche I’ve seen. Here’s hoping I win so I can put on my wall! This years crop are excellent. The one I most admire most is Ed Archer in the 1915 Ford. These Model T “Speedsters” were made from scratch, by than new race car drivers and mechanics who were the leaders and leading edge in our sport. What a great time that must to have been. From that humble beginning you can see how far this sport has advanced from viewing the rest of this years pictures. It has been a trip that we have all enjoyed. Lots of beautiful images — hard to choose! 1) Tim Scott’s Goodwood in the rain with #29 GTO/64 and #21 E-Jag leading other cars. Tie for 2nd: Tim Scott’s b/w C-Jags turning back the clock and Julian Mahiel’s #29 GTO/64 and #23 E-Jag in the rain. Wow! 1st, the colors of the 69 McLaren M8E @ the Speedfest Mitty against the background (Ferguson) – perfect for my office. 2nd the sense of speed captured in the sharpest of image of the 55 Porsche 550 Spyder 1500 RS @ Mille Miglia (Mahiels). And 3rd the lighting against the BMW 3.0 CSL @ Spa Classic (Mahiels) – perfect! Keep up the good – no, great – work. Save the best for last. Can’t beat Bjorn Waldegard jumping his Porsche 911 during the East African Safari Classic Rally. For sure Chris MacAllister’s Ferrari 312 T2…amazing car and history. With so many great photos to choose from, my favorite is David Ferguson’s image of the orange 1969 McLaren M8E at the Speedfest Mitty. Judging as a professional photographer myself it has to be the shot by Julien Mahiels of Bjorn Waldegard in the 911s during the Eifel Rallye Festival. Great composition, beautifully framed and great lighting. A memorable shot among so many other good shots. For me, it has to be the “1960 Ferrari 250 GT SWB Berlinetta at the Tour Auto Rally.” I just think the SWB 250 is the most beautiful car ever. Definitely the Peter Giddings Tipo C 8/35 Alfa Romeo. Great photo showing the concentration of the driver as well as agreat looking car. Paul Stewart in the Mercedes-Benz 300SLR Uhlenhaut Coupe at the Goodwood Festival of Speed for the sheer perfection of this work of art on wheels. Bjorn Waldegard soars his Porsche 911 during the East African Safari Classic Rally is my 2nd choice…amazing car and an equally amazing shot. Winner; the nighttime view of the BMW CSL at Spa. Close second; the 911 on the Safari Rally. I would also vote for the BMW CSL at Spa, because from a photographic perspective I’ve no idea how Julien achieved it. He got the car in focus (but still conveying motion) whilst it was moving away from him, and with no light save one at the trackside. I would have thought this shot was an impossibility. I also love some of the other shots, particularly the Porsche 550 at night, and the pictures of cars travelling behind the trees – again very tricky shots to get in focus. Black-and-white shot of the two C types at the Revival. Wonderfully atmospheric, and a great evening race to watch and hear. My vote goes to “Hemi under glass” from Goodwood! The “C” Type giving a wave – this typifies amateur racing for me! It is also a very good shot. All of them are worthy and excellent vintage race photos. My choice has got to be the Chevrolet Corvette Grand Sport of Bruce Canepa because of the interesting contrast of the vintage Corvette doing what it did best with the contrasting modern electronic apparel and paraphernalia (aerials, cameras etc) attached to it. Speaks to the electronic technology laden modern world we live in with the simpler mechanical world of the vintage car. Tim Scott’s black & white of the two C-Types at Goodwood. Start of the RAC Tourist Trophy Celebration Race at Goodwood Revival or the 300SLR Coupe with Paul Stewart are the most iconic photos in my opinion. The 1969 McLaren – what a beast! The brilliant orange contrasts with the dark background and a touch of blue – awesome car and awesome picture! The McLarens are pretty photogenic, but I’ll have to go with the Ed Archer 1915 Ford. Loved the Jag E type and GTO at Goodwood by Tim Scott, but for me, the best has to be the Alfa at Spa by Julien Maheils. What a great angle and what a beautiful car! McLaren M6B at Mont Tremblant. Awesome photograph. Framed just right. Light and shadow on the bodywork. Doesn’t get much better IMO. It has to be Peter Giddings in his 1935 Alfa Romeo Tipo C 8C-35. I remember that same photo from the early 1950s, the drivers were different, the cars different but that photo with Nuvolari, Ascari, Fangio, or Moss was in magazines of that era. We could recognize a car and driver 1/4 mile away. Drivers sat up in the cockpit where we could see them, Moss and Fangio just had a presence in the car, Shelby in his pink shirt and bib overhauls, Jackie Stewart and his tartan on the helmet. The cars were beautiful, red Ferraris, silver Mercedes or Porsches, blue Bugattis, white with a blue stripe Corvettes all with nothing on them but a number. This photo speaks to all of that. and races at Bridge Hampton. Can still see photo of S.Moss driving one at Bahama Speedweeks !!! Stephens Steers in his 1958 Echidna Roadster. Not only was it a beautiful piece of art, it sounded wonderful when he passed me. Many great shots, but it’s the “71 Tyrrell at the Nurburgring. 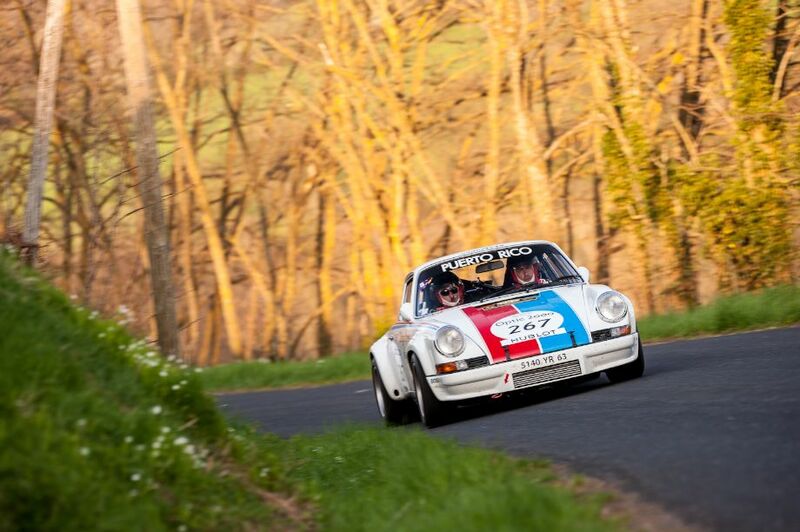 If I must choose my vote goes to: Ex-Bjorn Waldegard Porsche 911S that won the Monte Carlo Rally was at the Eifel Rallye Festival (photo: Julien Mahiels. But most of the photos are simply marvellous. Chevrolet Corvette Grand Sport of Bruce Canepa dives the down the corkscrew during the Monterey Motorsports Reunion (photo: Tim Scott) has my vote! Harsh words Craig. Are you a photographer yourself ? It’s obvious Craig is simply not aware of the staggering amount of effort that goes into producing these wonderful images. Well done to all, and thanks much for your efforts. Some great shots. Hurst Hemi under glass the 65 Plymouth Barracuda brings back memories from my days at Santa Pod with the Gold Rush team in the 60’s. Also love the shots of Goodwood in the rain, so on balance the Ferrari 250GTO and E type dancing in the rain (as I’m in the background under my umbrella) gets my vote. Like choosing a favorite grandchild…unfair! My favorite is Dennis Gray’s pair of McLarens battling it out – pure Can-Am memories of Bruce and Denny. For me the best 2013 vintage car racing photo goes to Julien Mahiels with the 1955 Porsche 550 Spyder at the Mille Miglia. The “1971 Tyrrell 002 looked at home on the Nurburgring during the Oldtimer Grand Prix (photo: Julien Mahiels)”, perfect camera pan. And the winner is ‘Lights, Camera, Action – BMW 3.0 CSL outside of La Source hairpin at Spa Classic (photo: Julien Mahiels)’. It makes you wish you were a wheelman yourself. This is an impossible task, but you knew that! Waldegard 911S by Julien Mahiels. As a photographer I love this one 1955 Porsche 550 Spyder 1500 RS at Mille Miglia (photo: Julien Mahiels). A great shot with the blurred background and the reflection of the car in the water. Has to be Jaguar E-Type Low Drag Coupe at Spa Six Hours. Great colors, great presence. 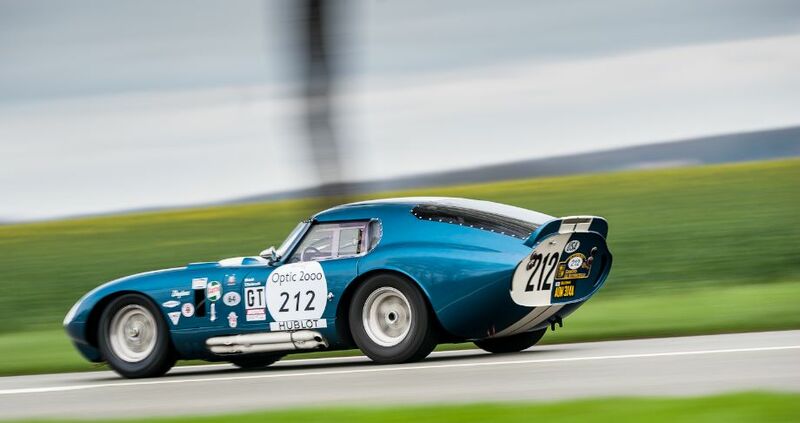 My favourite is the Julien Mahiels photo of the 1965 AC Cobra 289 at the Oldtimer GP but I also give consideration to Tim Scott’s photo of the Jaguar C Types at Goodwood and the photo by Nathan Leach-Proffer of the Peugeot 208 T16 at Pikes Peak. These are photo;s I would love on my wall and wish I had taken myself. Congatulations for having an unbelievable team of photographers and an amzing set of pictures, I bet it was hard to pick these 50, but it’s seems even harder picking the top one. But if I must, it would be “Lights, Camera, Action – BMW 3.0 CSL outside of La Source hairpin at Spa Classic (photo: Julien Mahiels)”, this picture has it all for me! My favorite is Tim Scott’s photo of the Ferrari 250 GTO/64 at Goodwood Revival dancing in the rain. Perfectly framed Cobra captures it all “here’s lookin at you”. All are wonderful photos, but my favorite? The ’55 Porsche 550 Spyder 1500 RS taken by Julien Mahiels…great in every way. A lot to choose from…and I’m a Corvette guy…but the best for my money is the Echidna, #66 raced (and mostly built) by Steve Steers. The car color and the background blend beautifully. Also, the threat of the blue overtaking car. The 1969 McLaren M8E at the Speedfest Mitty (photo: David Ferguson). 250 GTO and E-type in rain at Goodwood does it for me ! Julien’s photo of the Porsche 550 @ the Mille is superb…..streaking background….reflected image in the road….great colors…..great car……just wonderful. My favorite is the blurred background with the fast moving Silver Spider in it. It looks vintage, yet current, and it has the thrill of the ride in it. image # JMI-00581.jpg. Thank you again for giving me a front row seat to these great classic car events and boiling my blood so I get off my “you know what” and get my XKE finished so I too can feel the ride and show my pride. The RAC Tourist trophy race at Goodwood;great shot,beginning action,good assortment of classic racers! “Good Job” to all photographers and the website geeks. The Cobra at the “Circuit of the Americas” is my favourit. The photographer had a nice idea and choose a lovely car to put everything in a photo. Even the colours match! Black and white. Wet track. Dusk. Georgeous body shape. Wire wheels with knockoffs. It doesn’t get any more classic vintage than this! I have always felt that the Scarabs and Echnidas were the prettiest cars of that era. The blue of Steve Steer’s Echidna is the perfect shade to show off the gorgeous body lines and near perfect proportions. It’s great to see that car on the track being used as it was intended. So my vote goes to Steve and his Echidna. Looks like I’m agreeing with your assessment – it’s the ex Bjorn Waldegard Porsche 911S that won the Monte Carlo Rally and just looks beautiful in the woodland setting of the photo. Sports car photography is not about the marque of the car (although it is important), or how lovely the venue may be (although it can provide a good setting), it’s about capturing a moment that all sports car enthusiasts can share in spirit. I vote for “1955 Porsche 550 Spyder 1500 RS at Mille Miglia (photo: Julien Mahiels).” The dark foreboding skies, the perfect mirror image in the wet pavement, it captures the risk and the glory that is long-distance racing. The level of photography in Sports Car Digest is astoundingly high, so each photograph presented here is excellent and worthy of praise. I would say a close runner-up would be “A study in concentration. Peter Giddings in his 1935 Alfa Romeo Tipo C 8C-35 in turn eleven. (photo: Dennis Gray).” It perfectly captures the reason why so many of us find racing to be a worthwhile pursuit; alas, if the car could have been more identifiable, this photograph would have received my vote. To me, Jaguar E-Type Low Drag Coupe at Spa Six Hours (photo: Tim Scott), is on of the best. You can feel speed,… very nice photo!! All wonderful shots, but my favorite is of Steve Steers in his Echidna #66, leaning into a right turn at Circuit of Americas. If you are talking VINTAGE — then the best picture has to be Ed Archer with his hand on the brake stick !!! The picture of the Porsche 550 is the best. It looks like an Studio picture, very difficult to get with a car in action in a rally. It’s more than a picture: it is a poem. I vote for the 1926 Delage Grand Prix. Enjoyed all fifty shots, but if I must choose just one I’ll go with David Gray’s image of what it must take to drive a beautiful beast like that Alfa. The photo of Peter Giddings in the ERA at Laguna gets my vote. There are so many beautiful images here and I agree that the image of Peter Giddings in the 1935 Alfa Romeo Tipo C 8C-35 by Dennis Gray and that of the maestro Bjorn Waldegard in his Porsche 911 during the East African Safari Classic Rally by McKlein Photography epitomise these two very different forms of motorsport, but for me Julien Mahiels fantastic shot of the BMW 3.0 CSL in the dark at La Source in Spa has to take my vote – it has everything. As always, too many great photos to choose from, but the SWB Berlinetta through the trees/bush is just fantiastic! It shows pure drama and excitement at the start of a race. I just love Dennis Gray’s shot of the 1926 Delage Grand Prix 15-S-8 driven by Peter Giddings in the corkscrew during the Monterey Motorsports Reunion. It epitomises the mechanical beauty of older historics. Image #50 brilliant combination of action, composition and lighting. Not voting with bias for my favorite car here but for the actual photo taken. The BMW 3.0 CSL at La Source is my favorite. The lighting, motion & color in a night image. Very nice. Hard to pick out one but “Hemi Under Glass” gets my vote for capturing the moment. My favorite is Peter Giddings in his 1935 Alfa Romeo Tipo C 8C-35. Great detail and captures a driver at his best. 1973 911 RSR at the Tour Rallye. Classic 911 in classic livery. My vote is for Stephen Steers in the beautiful blue 1958 Echidna #66. The Echidna is a fantastic racer that most of the world has no idea about. I have seen this car at Goodwood, as well! My vote is for Ex-Bjorn Waldegard Porsche 911S that won the Monte Carlo Rally was at the Eifel Rallye Festival. Hemi Under Glass !?!?!?!?!!! WOW!!! Without question for me….the ’59 Ferrari TR 59/60Fantuzzi Spider on the Colorado Grand Rally. This is what it’s all about……the open road ,fabulous scenery and a great car to enjoy it all with ! It doesn’t get any better than that. This photo is really stealing a glimpse at a rare and beautiful car. Like spotting a shy and graceful gazelle at a watering hole, with a dry wasteland in the background. A blur of green foliage blocks part of the subject, but it doesn’t detract from the speed and grace with which the car moves up into the turn. Brian Johnson’s Lola is the one for me. Among all of these brilliant images, it’s the one that speaks to me because you can really see the strain the chassis is under from the combined forces of cornering and acceleration. It beautifully captures the Speed and atmosphere in my opinion. The photo of 2 C types at Goodwood gets my vote. Black & white photography is classic in itself. Yet the helmets and the vestigial roll bar on the overtaken vehicle show this is a modern rather than a historic image. The contrasting main and dipped beams put this one over the top. As an aside, I would never vote for a Coventry car as an automobile. It’s the picture and the photographer I am praising. Favorite car of all time so this is a no brainer. All 50 are great photo’s, finding just one was difficult. As a Ferrari owner it was hard to pick a photo without the Cavalini Rampanti but the colors and clairty of the 1969 McLaren M8E (photo: David Ferguson) Stood out and reminded me of seeing the cars run at Road America back in the day! I pick three: all show good action. Peter Giddings in the 1935 Alfa 8C is my vote. Steve Steers gets my vote of a great old backyard special from my days of racing. Looking GOOD Steve! Got to be Tim Scott’s C-Types Turning Back the Clock at Goodwood surely!! I’ve got to go with “Ford GT40 battle for ‘La Source’ at the Spa Six Hours” from Tim Scott. As an aside, would you or any of your photographers consider adding a “desktop wallpaper of the week” feature? I’d love to have large-format digital copies of so many of your pictures, even if you wanted to put a “Sports Car Digest” or photographer’s watermark in the corner. Steve Steers in his Echidna. A beautiful car and full concentration by the driver. For me, the stunning McLaren M8e at Speedfest Mitty by David Ferguson. also Sebastian Loeb at Pikes Peak! but thanks again for your superb shots by your contributing photographers. So many great photos to choose from! I too was leaning toward the dramatic shot of the 550 spider in the wet, but my vote goes to the shot of the BRG Jaguar “C” type at Goodwood, with the driver flashing a “V” for victory. It says everything about the best of vintage racing: old Jaguars, Goodwood, and the sheer satisfaction and joy of piloting a classic around a track at speed. As a Brit I can tell you that the V sign is not necessarily a V for victory. In this context I think he’s being very rude to the photographer. I’m the photographer, and I know the pilot of the C Type very well ! Martin – were you at Bonneville in a Mustang in August ? All good, but “1955 Jaguar D-Type at Lime Rock Historic Festival” is the most “artistic” to my eye. It was hard to pick a favorite. 1964 Ferrari GTO and Jaguar E-Type at Goodwood is my favorite of the many images I have loved seeing the past year. It was a tough choice, but this image captures for me the look and feel of GT racing in that era. I can see this image in B&W on the cover of Motorsport in the day. As usual, Dennis Gray gets my vote for the best photo. But it’s a tie between the photos of the Alfa and the Delage. That shot captures my memories of the compitition in that series. So many wonderful cars, many of which I know and recognize and many more I would like to put in that category at several venues I’ve attended and all I would like to. But doesn’t it just have to be “A study in concentration. Peter Giddings in his 1935 Alfa Romeo Tipo C 8C-35 in turn eleven”. This just epitomizes the essence of historic car racing. The driver and his/her machine, no aids, just working it. Couldn’t be better. A close personal second is Ed Archer at the Monterey Motorsports Revival. I’ve met and talked with Ed on more than one occasion at Laguna Seca over the years and he is a true gentleman of the sport. How many of you know he drives that car to and from the track? I’ve followed him up Hwy 101 at least once! Jaguar E-Type and Ferrari 250 GTO/64 at the Goodwood Revival (photo: Julien Mahiels). Racing irreplaceable cars in dangerous conditions. A wonderfully extravagant display of disposable income. Barely any water on the lens. Reading some of the other comment made me realise I had not lavished praise on Julien Mahiels for the stunning technical quality of his picture of the Jaguar E-Type and Ferrari 250 GTO/64 at the Goodwood Revival. The cars are vividly sharp against an indistinct background. In poor light, depth of field would be an issue and he has both cars at about the same distance. The water plumes clearly show the cars are at speed; the track is a blur and its clear he was panning with the cars which makes this a one in one thousand shot. 1959 Ferrari TR 59/60 Fantuzzi Spider. For the great overall composition. GREAT PHOTO. 1965 AC Cobra 289 at Old Timers Grand Prix. Having built and actively tracked a reproduction of this car, the adrenalin rush is hard to beat. I feel myself in Peter Gidding’s ’35 Alfa, and share the commitment seen in the photo. Also love Archer’s ’15 Ford. I have loved the image of the Jaguar E-Type battling the Ferrari 250 GTO in the rain at Goodwood from the moment I first saw it. The visual image of these two very spectacular cars enmeshed in a brutal combat for naught but the glory of winning, evokes feelings of excitement and amazement. Anyone who has driven in pouring rain knows but a fraction of the angst that these two drivers are experiencing. I can only imagine their heightened awareness of everything going on around them, while they strain to control these two monsters, as the road surface and visibility rapidly change. Though we cannot see inside the cockpits, the sight of white knuckles and gritted teeth is easily imagined. I vote for Julien Mahiels picture because through some measure of luck and great skill the photographer has captured the essence of high speed racing. The blurred background and rooster tails indicate high speed, but the composition of this picture, with both cars centered in the frame, yet they look like they are going to jump out of the picture, sets this awesome image apart from most other scenes of cars racing in the rain. This picture definitely gets my vote for Best Picture of the Year! Chris Bender’s 1972 McLaren M8FP in two at Laguna Seca for the Legends of Motorsports Powered by HMSA event (photo: Dennis Gray) -“Chasing McLarens” would be my title. Jaguar E-Type and Ferrari 250 GTO/64.GoodwoodRevival ( Julien Mahiel ) This magical shot of racing hard in heavy rain is more like a Michael Turner painting than a photo. Doing what they were made for. Page 9, Jaguar E-Type and Ferrari 250 GTO/64 at the Goodwood Revival. What a great shot! As G. Holdsworth said, like a Michael Turner painting than a photo. #26 Delage by Denis Gray. Beautiful car, great photo. (page 6). I really like the 69 McLaren M8E, such great colors without clutter. My first choice is the battle between the Jaguar and the already scarred 250 Ferrari Gt at Goodwood. But Paul Stuart in the Mercedes is an exceptional photo. Gray’s picture of the Delage at Monterey is wonderful, and it must be said that all the pictures are excellent. 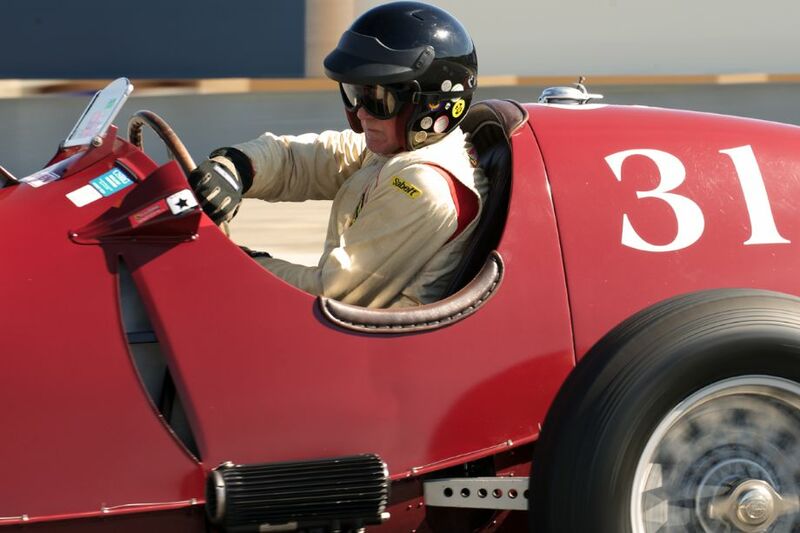 Only on gave me pause: What in the world is Peter Giddings, in the Alfa, doing with his hands? 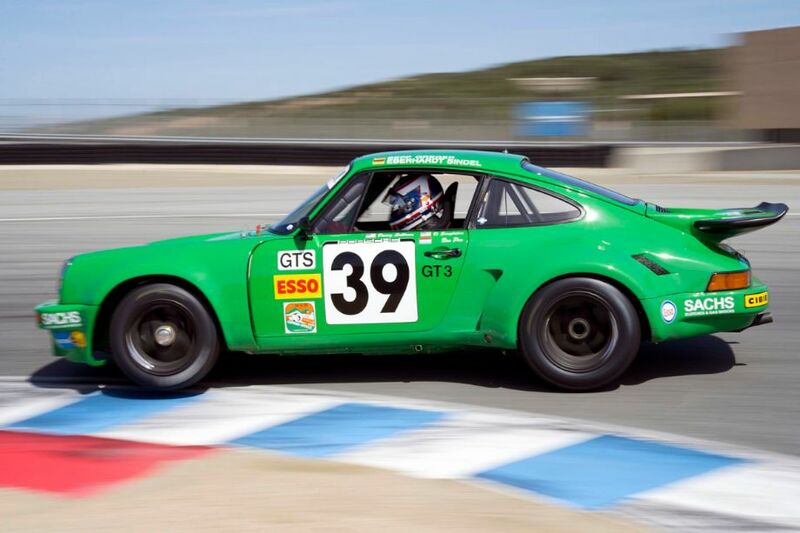 Peter is in the tight Laguna Seca left turn eleven. That big Alfa is not easy to get around a tight turn at speed. cars with those skinny tires around a track. Thanks for taking time comment. The Stephen Steers Echidna at COTA is the epitome of the grass roots Vintage racer resurrecting the period vehicle. I would like to take a minute to thank all the SportsCarDigest.com readers who responded with comments on the fifty 2013 images. I found your comments without exception to be well thought out and as a photographer valuable. To my fellow photographers your work continues to impress. Thanks to SportsCarDigest.com editor and publisher Jamie Doyle for his leadership and most of all his ability to put up with us. Congratulations too to all you photographers and the SportsCarDigest staff for a visually strong 2013. Cannot wait to see what 2014 produces. 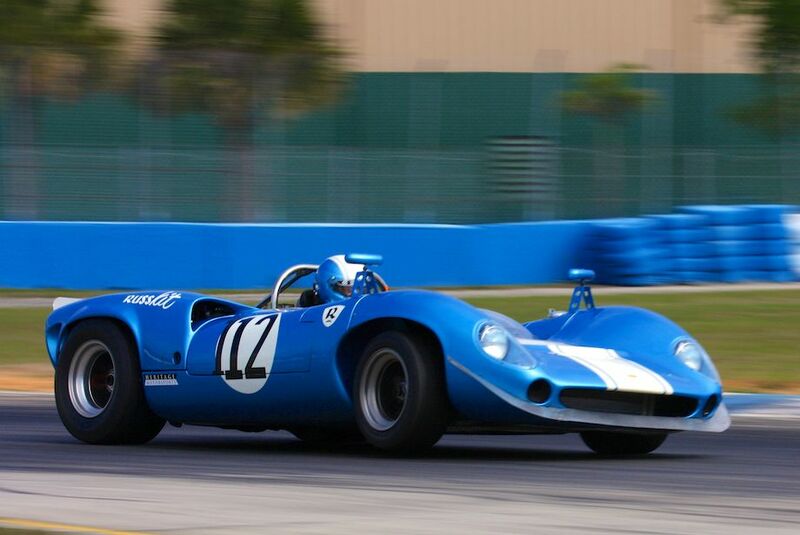 1969 McLaren M8E stood out at the Speedfest Mitty (photo: David Ferguson) is the best. You have to love the original Mclarens. Great pic. The Cobra on the new COTA track framed by the tower. Elegant composition! Craftsman use of the telephoto; these things do not line up to the naked eye! Red details throughout. There are so many great picture, it is hard to choose, the the Cobra Daytona Coupe is my favorite, followed by the two Ford GT 40’s. There were many other great shots too, BMW CSL night-time La Source, the duelling Ford GTs, wet weather at Goodwood, DType at Lime Rock. Best year yet!!! My vote goes with the 1926 Bentley 3-41/2 getting wet.